Kirsten Bresciani is a visual artist who is originally from Queensland. Kirsten has had a love for photography ever since picking up a camera in year five and spent a number of years overseas working as a photographer, before settling back in Melbourne. While in San Francisco, Kirsten started a personal project 'Florascopic' which she will be exhibiting this month at Birds Gallery. This project focuses on the transformation of nature in a modern urban environment, with snippets of urban gardens twisted and manipulated to give a kaleidoscopic effect. A completely integrated color control solution to calibrate your displays, projectors, scanners and printers! The professional level, start-to-finish color management solution built by Color Perfectionists for Color Perfectionists. 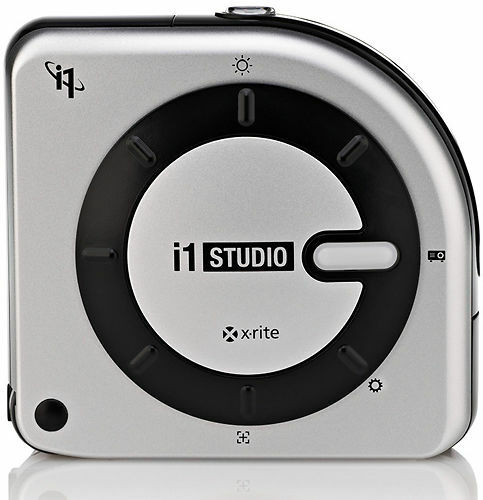 The NEW i1Studio from X-Rite was created for photographers who love to shoot, scan, edit and print, but don’t love to waste time and money on the process. The award-winning and patented technology built into the i1Studio delivers precise, intuitive color management across your entire color workflow. The end result: prints that match your images across all your devices. i1Studio software delivers the perfect balance of automation with a full range of creative controls for photographers, filmmakers and designers looking for more options and control over their color. You’ll be guided through every step with an expanded range of expert options to customize and fine-tune your workflow as desired. 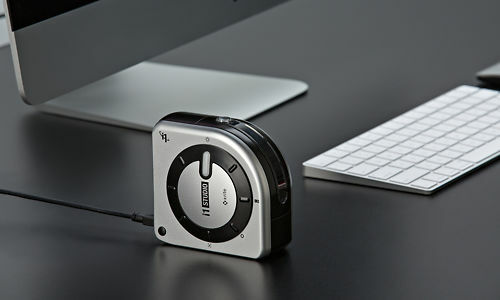 i1Studio Device: The award winning, patented, all-in-one i1Studio spectrophotometer is the only device you need to profile your monitors, projectors, scanners, mobile devices and printers. It is compact and easy to carry in it’s own protective bag so you are never without the means to create an expertly calibrated and profiled workflow whether at home, in studio or on the road. i1Studio Software for Monitors, Projectors, Scanners and Printers: i1Studio software, based on X-Rite’s award winning i1Profiler software, provides an easy to navigate interface that delivers expertly calibrated and profiled monitors (including video presets), projectors, scanners and printers. 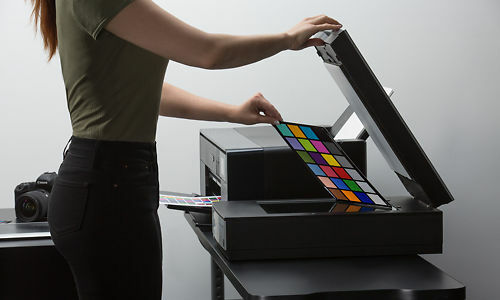 Once you take the guesswork and frustration out of making sure the color you see on your display is the color you expect from your printer, you’ll save time and money and gain full creative control over your images. i1Studio uses advanced technologies to perfect the match between your display and printer. Intelligent Iterative Profiling: an adaptive technology that produces optimized results for maximum color accuracy on each unique display every time you profile. Video Standards Support: NTSC, PAL SECAM, Rec. 709, Rec. 2020 and DCI-P3. Extended User Controls: Custom control of white point, luminance, contrast ratio and gamma. Also, measure other displays or light sources and use as targets. Multiple Monitor Profiling: Color match up to four separate displays for color accuracy across all your workflow. Profile Validation and Reminder: View before and after results with included images or load your own, or use the 3D profile gamut viewer; set reminder intervals to re-profile your display. Now, your projected presentations can look the same as your monitor. Build an accurate projector profile in just minutes – it’s as easy as building a monitor profile. The process takes all the room conditions into consideration – projected colors, screen color and room lighting – so you can be confident that your projected images are showing the way you intended. Scanner profiling is super easy. Simply scan and crop your target to generate a high quality ICC profile. Supports these targets: ColorChecker Classic (Standard and Mini sizes), ColorChecker Digital SG, Reflective IT 8.7/2, Transmissive 4x5 and 35mm IT8.7/1. Intelligent iterative profiling technology ensures your output is reproduced accurately from print to print and from printer to printer, delivering professional quality results for smoothness, highlight and shadow detail. i1Studio’s superfast scanning can rapidly measure test charts in less than one minute! Simply scan one 50-patch test chart, and i1Studio will learn how your printer behaves with these colors and dynamically generate a second chart of 50 patches. Then print and scan this second chart of 50 patches and your profile is perfected! Option to save your test targets as TIFF files to print later, or for use on a remote printer. i1Studio also supports various paper sizes. i1Studio even has the ability to optimize your printer profile for specific colors, flesh tones or captured spot colors. 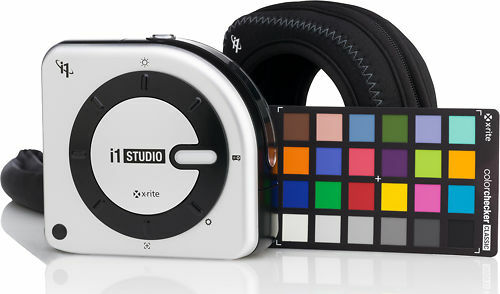 i1Studio creates a 3rd test target based on extracted colors from an image and/or spot colors captured by your i1Studio device. Load your profile, generate your test target, measure and save. It’s that easy. Utilizing the same intelligent iterative profiling technology for color prints, our B&W module is specifically engineered to ensure the highest quality results for your black and white prints, resulting in exceptional smoothness, highlight and shadow detail. Simply scan one 50-patch test chart, and i1Studio will learn how your printer behaves with these colors and dynamically generate a second chart of 100 patches to better define neutrals. Print and scan this second chart and your B&W profile is now perfected! Once you’ve converted your image to B&W and are ready to print, simply apply your custom B&W profile. There is also the option to create a profile for a specific B&W look including High Contrast Neutral, Platinum, or Sepia. For those of you who love B&W printing, prepare to be amazed. 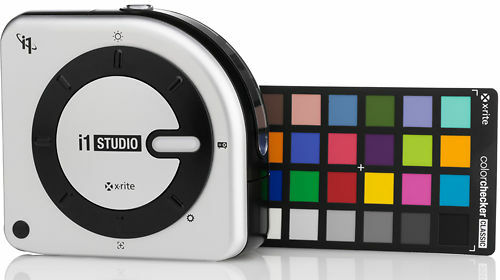 The NEW i1Studio from X-Rite takes your start-to-finish color-managed workflow to an expert level with exceptional accuracy and consistency allowing you more time to focus on creating more images. Hand curated articles, links and downloads to help you get the best from your X-Rite i1 Studio.